God bless Japan’s love of British 90s music. 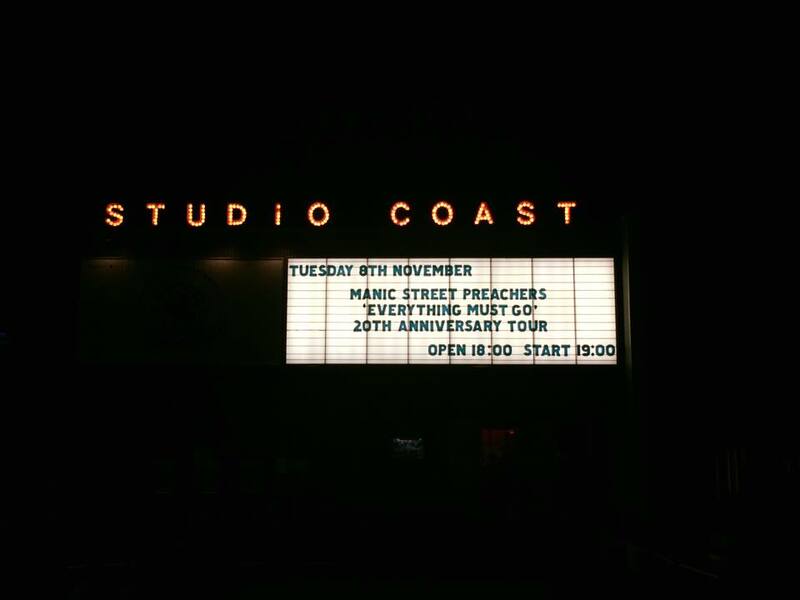 After last year’s day out at Summer Sonic to see the Manic Street Preachers perform Richey Edwards’ masterpiece The Holy Bible for its 20th anniversary, this time it was the turn of Everything Must Go to get the start to finish treatment. For those who don’t know, Richey disappeared not long after The Holy Bible’s release and was never found – legally presumed dead in 2008. Rather than calling it a day, the remaining three members carried on and released Everything Must Go to critical acclaim. On a personal level, despite not being my favourite Manics album (The Holy Bible of course takes that accolade), this record is an incredibly important one for me. I’m a little too young to claim to remember The Holy Bible first time around (don’t let the bald head fool you!) so Everything Must Go was my first real introduction to the band. Yes, I did have the best taste in music for a six year old. 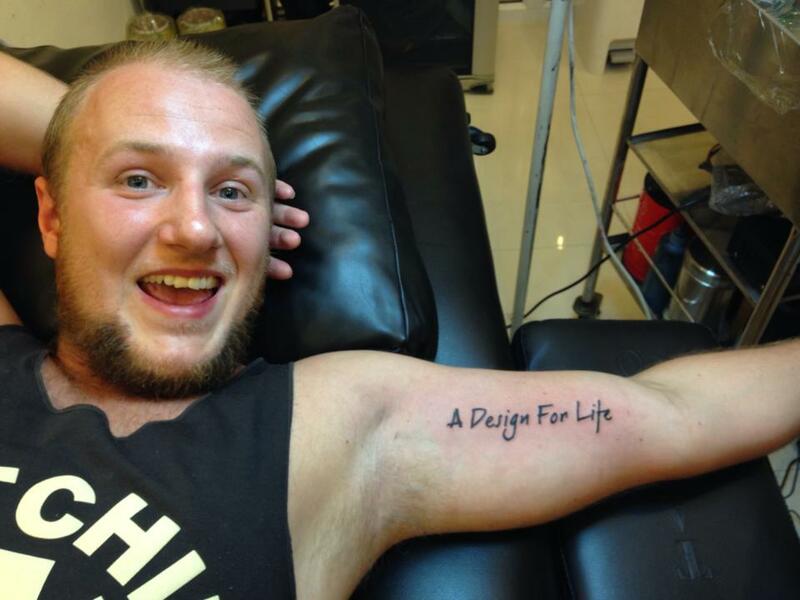 In fact, the album has provided the soundtrack to many different periods of my life, so much so that I actually have the title of its iconic single A Design For Life tattooed on my arm in memory of my mother. Flashbacks to Bangkok 2014 and a dreadful beard. The first observation of the evening was that Shin-Kiba is a heck of an inconvenient place for a gig. Well, unless you happen to live around that area of course, but this is my blog and I live in Kichijoji, so it’s inconvenient. The Studio Coast venue actually doubles up as one of Tokyo’s biggest nightclubs, ‘Ageha’; I can’t say I’ll be going all that way for a night of house music of whatever people call it these days! The venue itself was pretty decent though and had one of the cooler, retro style advertising boards outside which people seemed to be queueing up to take a picture of. Naturally I had to get in on the action too. Can’t beat ’em, join ’em! After the obligatory drinks purchase – and I’m not just trying to justify buying a beer, you actually have to pay for a drink on arrival at most gigs here – I headed down to the ‘pit’ (do people still call it that?) to catch the second half of the support act. This time I did my research beforehand so I was happy arriving a little after the designated start time safe in the knowledge I wouldn’t miss any of the main act unlike some gigs I’ve attended over the past year! The support act were a Japanese band called Grapevine who I can’t claim to know anything about, but they were decent enough and a quick search of Google would suggest they’ve been around for ages and have put out quite a few albums too. Hey, I never claimed to be an expert on Japanese rock bands! 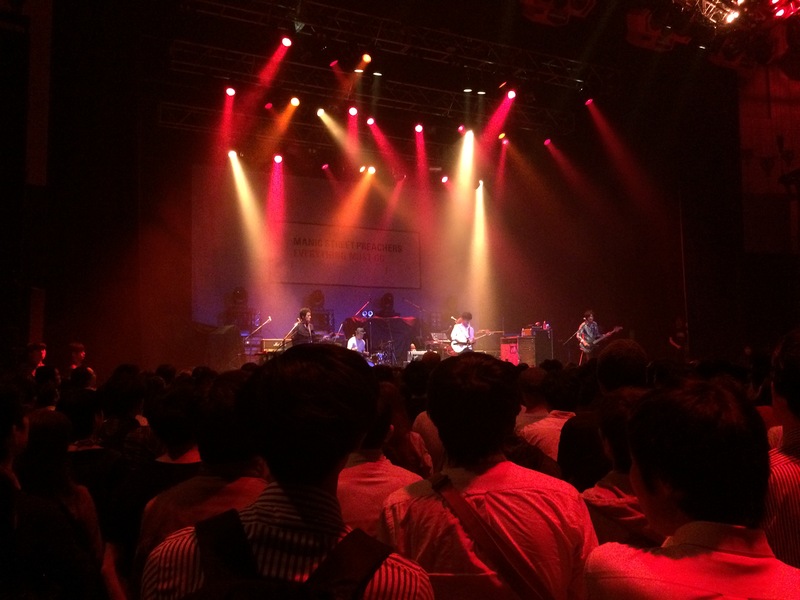 Support act Grapevine were pretty decent and – so I’ve been told – already quite a big band in Japan. Just after 8pm the lights went down and the familiar (to anyone who’s heard the album anyway!) sound of waves crashing from the sea rang out over the speakers as James Dean Bradfield took to the stage and went straight into the intro of the album’s opening track Elvis Impersonator: Blackpool Pier. He was joined by the rest of the band as the song kicked in and the gig was off to a belting start. A little more of a subdued opening than the raw, frenetic verses of The Holy Bible’s Yes which we witnessed last year, but still a great opener. 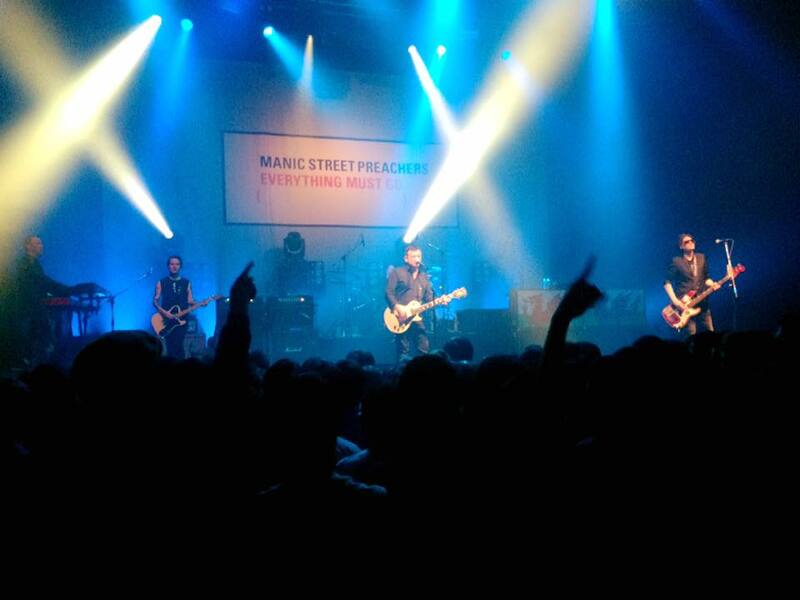 Now I don’t have many complaints at all (it’s a miracle, I know…) and this isn’t really a complaint, but one of the things I love most about gigs in the element of surprise – especially with a band who has a back catalogue as extensive as the Manics do. They’ve got 12 studio albums to play with and are known for throwing a few surprises into the set (more on those later!). As great as it’s been to hear these two albums played from start to finish, I do find myself anticipating the second half of the set more and more as the gig goes on! The Everything Must Go tracks came thick and fast and it was nice to know the band would be ending on a different song than the aforementioned A Design For Life as that’s the second track on the album. Every time I hear the track live it gives me a goosebumps because of the memories I associate with it and last night was no different. In comparison to the two Holy Bible gigs I saw in 2015, the band seemed a little more interactive this time around in terms of speaking to the crowd. I can only imagine the process of playing this album was a much nicer one than that of its predecessor for obvious reasons and it seemed to show on stage as JDB tried to get the crowd talking about rugby and even playfully said “F*ck you” to an audience member who suggested Wales wouldn’t win the next World Cup – lovely stuff! Now as I mentioned before, this particular album isn’t my favourite one of theirs musically and – confession time – I often find myself skipping the middle section when I’ve got it on the iPod. That said, it was nice to hear a number of songs I’ve never heard live before – most of which came from this middle section – such as The Girl Who Wanted To Be God, Interiors and a few others. The albums ends strongly with Further Away which bassist and songwriter Nicky Wire pointed out was actually a single, but only in Japan, and No Surface, All Feeling which – behind Motorcycle Emptiness – contains one of my favourite Manics riffs. After this the rest of the band left the stage and JDB kicked off the second part of the set with an acoustic rendition of Stay Beautiful despite not remembering half of the words. Well, it is 25 years old! Thankfully the crowd were in good voice and helped him along as best they could. This was followed by a lovely performance of Ocean Spray which was accompanied by a bit of trumpet too. Nicky, drummer Sean Moore and the rest of the band joined the frontman on stage after this and kicked off a set of hits and rarities with You Love Us which sent the crowd into an absolute frenzy. It would have been easy for the band to just fall back on hits like If You Tolerate This Your Children Will Be Next and Your Love Alone is Not Enough but every time I’ve seen the Manics (barring the time restricted Summer Sonic set) they’ve managed to throw in a few curveballs here and there. Last night it was the turn of A Song for Departure 2004’s divisive Lifeblood album (“Just to p*ss off everyone back home” according to Nicky!) and Born to End off the debut album Generation Terrorists. I’m still waiting for the day they finally play The Next Jet to Leave Moscow live, or decide to put 1985 back into the setlist, but these two nevertheless satisfied my cravings for a few rarities. I’m sure the 20th anniversary of Lifeblood will be just as big an event when it rolls around in 2024…maybe. 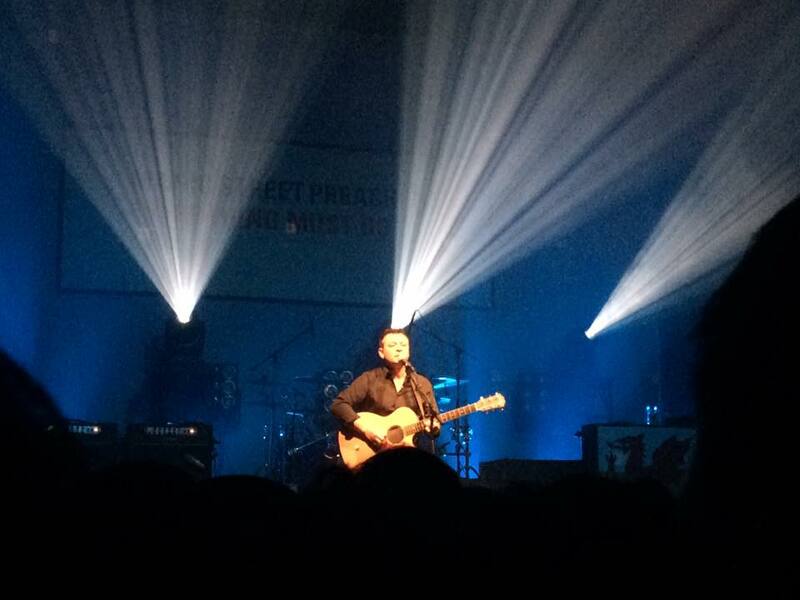 If there is a better lead guitarist/frontman than James Dean Bradfield then I’m yet to see him. The 11 song second set drew to a close with Motorcycle Emptiness and the masses drudged out into the rainy night, half of us umbrella-less as it hadn’t been p*ssing down when we arrived! Roll on the 20th anniversary of This Is My Truth Tell Me Yours in 2018!